A few days ago I had the opportunity to visit the Schliffkopf, one of the highest summits of the northern Black Forest, in order to add Citril Finches to my year list – and also to see them again for the first time since 1995. Citril Finches used to be rather common on the sub-alpine meadows of the Black Forest, but their population is undergoing a serious decline and it is currently feared they will soon be extinct in Germany outside the German Alps. The Schliffkopf, in particular the area along the track behind the Schliffkopf Hotel, is one of the last places where one still has a chance of seeing them in the northern Black Forest. 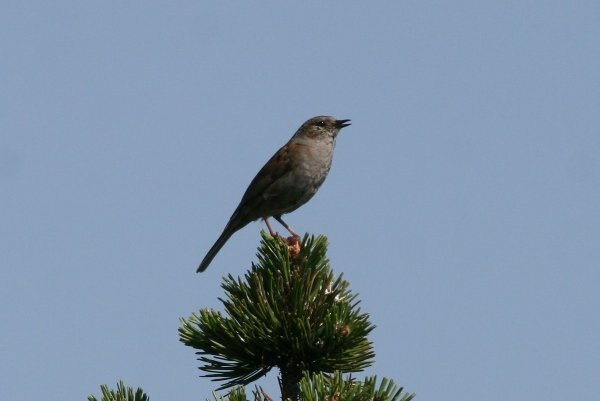 The baldness shown by the Dunnock on the Schliffkopf strongly indicates that the bird is infected with the Usutu-Virus, and this means the bird will be dead by the time you read this post. It also means the virus that has swept through the songbird populations of the wider Heidelberg area like a firestorm in 2011 is still there, and spreading. And it might very tragically mean the final nail in the coffin of the Black Forest’s Citril Finches. As for the finches, I saw one after an exhausting search. For now at least, they still seem to be around. But for how much longer is anyone’s guess now. 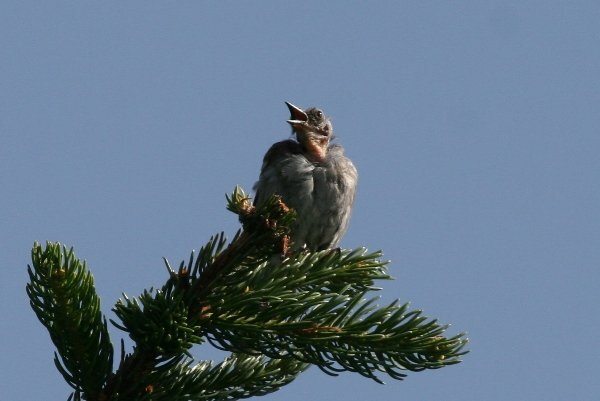 Therefore, a grim reminder to all birders in Europe: look after your songbirds! There is nothing we can do to stop the spreading of the Usutu-Virus except documenting it, and the affected populations of common species in other regions of Europe have recovered after a few years. But the virus might mean that we will lose some smaller, possibly already endangered populations. And this loss might be permanent. I was shamefully ignorant of USUV until reading this post. Thanks for the reminder it’s time to get my head out of the North American sand! Where Are You Birding This Final Weekend of June 2013?